Hyperbaric Oxygen Therapy (HBOT) is an effective treatment for diabetic neuropathy. By driving oxygen deep into tissues, it reduces cell death and pain symptoms. Hyperbaric oxygen also stimulates the growth of new blood vessels, enabling the body to increase effective oxygen and nutrient delivery. Hyperbaric oxygen therapy is a medical treatment that uses pure oxygen to speed and enhance the body�s natural ability to heal. Hyperbaric oxygen therapy is an American Medical Association, FDA and Medicare approved modality. While sometimes hyperbaric medicine procedures are used as a primary emergency treatment, it is more often used as a cost effective adjunct or enhancement therapy. Of the estimated 20 million people in the United States with diabetes, 3 million struggle with DPN�and even patients with pre-diabetes and impaired glucose (blood sugar) tolerance may have symptoms. The older the person is, the longer he or she has had diabetes, and the less-controlled the disease, the greater chance of feeling pain because of damaged nerves. Fifty percent of patients with long-standing diabetes have numbness, burning, electrical sensations, stabbing, or shooting pain in their feet or legs�and it�s usually worse at night. While the pain is uncomfortable, the lack of sensation can have even worse consequences. If a person�s shoes fit improperly, are too tight, have rough spots inside, or rub when the person walks, the blisters, abrasions or cuts may not be felt. Because circulation is not as good as it is for people without diabetes, these wounds can become infected and very difficult to heal. If there is tissue damage and a wound that resists healing, many insurance companies will cover Hyperbaric Oxygen Therapy. For more information go to Diabetic Neuropathy Therapy. During hyperbaric oxygen therapy (HBOT), the patient breathes pure, 100% oxygen under increased atmospheric pressure. (The air we normally breathe contains only 19-21% of this essential element. The concentration of oxygen normally dissolved in the bloodstream is thus raised many times above normal (up to 2000%). With HBOT therapy, in addition to the blood, all body fluids including the lymph and cerebrospinal fluids are infused with the healing benefits of this molecular oxygen. It can reach bone and tissues which are inaccessible to red blood cells, enhance white blood cell function, and promote the formation of new capillary and peripheral blood vessels. Hyperbaric treatment results in increased infection control and faster healing of a wide range of conditions. 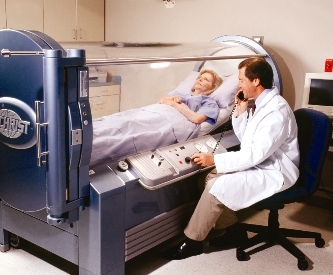 HBOT is a medical treatment. You should locate a HBOT facility near you and get a consultation before beginning this treatment. Once you're comfortable with it, you can also purchase chambers for home use if you have a severe case. Currently we don't have a reliable referral source yet, but we're working on it. You may wish to type in "hyperbaric oxygen therapy" along with the name of your city into a SEARCH ENGINE to find a center near you. HBOT works very well when combined with other natural protocols. Example: ReBuilder, nutrition, other oxygen sources, control diabetes. The more severe the suffering, the more you should do to combat the condition. See more about treatments here. A few studies on HBOT for review. Several studies have documented the effectiveness of hyperbaric oxygen in models of acute and delayed crush injury. Intermittent exposure to hyperbaric hyperoxia serves to interrupt the injury cycle of edema, ischemia and tissue necrosis, as well as hemorrhagic hypotension, which in turn leads to former edema and ischemia. Tissue ischemia is countered by the ability of hyperbaric oxygen to elevate tissue oxygen tensions. Furthermore, edema is reduced, secondary to hyperoxia-induced arteriolar vasoconstriction, leading to improved tissue viability, thereby reducing necrosis. Hyperbaric oxygen has also been studied in models of peripheral nerve injury. Researchers from the US Air Force School Aerospace Medicine and Louisiana State University recently sought to determine what, if any, morphologic changes are associated with hyperbaric oxygen treated peripheral nerve injury. Their model involved a crushed sciatic nerve in the rabbit. Effect of hyperbaric oxygen therapy on nerve regeneration in early diabetes. Aydin A, Ozden BC, Karamursel S, Solakoglu S, Aktas S, Erer M.
Nerve regeneration in diabetes is essential for reversal of neuropathy as well as the recovery of nerves from injury due to acute nerve compression and entrapment. Endoneural hypoxia due to hyperglycemia-induced blood flow reductions is observed early in the course of diabetes, and the resultant ischemia plays a role in the diminished neural regeneration. Hyperbaric oxygen therapy is capable of producing tissue hyperoxia by raising oxygen tensions in ischemic tissues, and was shown to be beneficial in the reversal of experimental ischemic neuropathy. In this study, an experimental diabetes model was used to evaluate the functional and histomorphological effects of hyperbaric oxygen therapy on early diabetic nerve regeneration. Our results indicate that there is significant histomorphological impairment of nerve regeneration, even in very early stages of diabetes. However, no beneficial effects of hyperbaric oxygen therapy could be demonstrated at this stage. Copyright 2004 Wiley-Liss, Inc.
Viera C, Galvez C, Carrasco B, Santos C, Castellanos R.
Departamento de Neurofisiologia Clinica, Hospital Clinico Quirurgico Hermanos Ameijeiras, La Habana, Cuba. INTRODUCTION: There are some occlusive disorders in the vasa nervorum and metabolic changes disminishing oxygen liberation by erytrocites at the capillary blood vessels, and these disturbances lead to endoneural microhypoxia. Hyperbaric oxygen reverts hypoxia in the diabetic neuropathy. OBJECTIVE: We studied motor and sensitive peripheric neuroconduction in nine diabetic patients, with distal symmetrical polyneuropathy, during normoglycemia. Four of them were insulin dependent and five were non insulin dependent. PATIENTS AND METHODS: The electrophysiological studies were done before treatment with hyperbaric oxygen, in a week, three and six months later. The abnormal electrophysiological parameters detected in diabetics were terminal latencies (enlarged), velocities of conduction (slowed) and distal amplitudes of compound action potentials (reduced). RESULTS: Neither distal latencies nor distal amplitudes and conduction velocities in peroneal nerve showed significative changes in the statistical analysis. We observed slower conduction velocities in the motor fibers of the median nerve in the examination performed six months after treatment. There was an increase of distal latency and retardation of the velocity of conduction six months later after treatment in the sensitive fibers of median nerve, whereas the amplitudes of sensitive action potentials decreased progressively. These changes suggest large diameter peripheral fibers didn't receive benefit with hyperbaric oxygen treatment. CONCLUSIONS: In all patients disappeared all symptoms of dysesthesias, paresthesias, distal pains and cramps in the legs and arms, suggesting functional changes in small unmyelinated fibers which we can't test with conventional techniques to prove it. Experimental ischemic neuropathy: salvage with hyperbaric oxygenation. Kihara M, McManis PG, Schmelzer JD, Kihara Y, Low PA.
Department of Neurology, Mayo Foundation, Rochester, MN 55905. Hyperbaric oxygenation is effective in augmenting the delivery of oxygen to tissue, but also causes oxidative stress. As part of our focus on improving peripheral nerve salvage from ischemic fiber degeneration, we evaluated whether hyperbaric oxygenation rescues peripheral nerve, rendered ischemic by microembolization, from ischemic fiber degeneration. The supplying arteries of rat sciatic nerve were embolized with microspheres of 14 microns diameter at moderate (2 x 10(6)) and high (5.6 x 10(6)) doses. Rats were randomized to receive hyperbaric oxygenation treatment (2.5 atm 100% oxygen for 2 hours/day for 7 days beginning within 30 minutes of ischemia), or room air. End points for the embolized limb were (1) behavioral scores (0-11 in increasing levels of limb function), (2) nerve action potential of sciatic-tibial nerve, (3) nerve blood flow, and (4) histological grade as percentage of fibers undergoing ischemic fiber degeneration (0 = < 5%; 1 = 5-25%; 2 = 26-50%; 3 = 51-75%; 4 = > 76%). Nerve blood flow and nerve action potential were uniformly absent and more than 90% of fibers had degenerated in both control and treatment groups receiving high doses. Control and treatment groups receiving moderate doses were well matched by level of ischemia (8.5 +/- 0.3 [N = 18] vs 7.7 +/- 0.4 ml/100 gm/min [N = 18], p > 0.05) but were significantly different by behavior score (5.6 +/- 0.7 vs 9.2 +/- 0.5 [N = 19], p < 0.001), nerve action potential (1.4 +/- 1.0 vs 3.9 +/- 0.5 [N = 6], p < 0.05), and histology (2.4 +/- 0.4 [N = 5] vs 0.8 +/- 0.5 [N = 4], p < 0.05). On single teased fiber evaluation, the predominant abnormality was E (axonal degeneration). We conclude that hyperbaric oxygenation will effectively rescue fibers from ischemic fiber degeneration, providing the ischemia is not extreme. Effect of hyperbaric oxygenation on normal and chronic streptozotocin diabetic peripheral nerves. Low PA, Schmelzer JD, Ward KK, Curran GL, Poduslo JF. Department of Neurology, Mayo Clinic, Rochester, Minnesota 55905. Hyperbaric oxygenation is known to affect energy metabolism and endothelial cell structure and function, but its effects on peripheral nerve have not been reported. We investigated whether it would (i) reverse established streptozotocin-induced diabetic neuropathy, a condition in which endoneurial hypoxia exists; (ii) affect energy metabolism in nerve; and (iii) alter the blood-nerve barrier. Sprague-Dawley rats that had been diabetic for 3 months and age-matched controls were used in these studies. One diabetic group and one control group were treated with hyperbaric oxygenation (2 atm for 2 h, 5 days/week) for 4 weeks. Identical groups remained in room air. Sciatic nerve adenosine triphosphate (ATP), creatine phosphate, lactate, and glucose concentrations showed similar changes at rest in both room air and after hyperbaric oxygenation. Nerves of control and diabetic groups exhibited increased lactate production and increased utilization of glucose, ATP, and creatine phosphate after 15 min of anoxia. The albumin blood-nerve barrier index was increased in control and diabetic nerves after hyperbaric treatment. Nerve conduction velocity was reduced in the diabetic-room air group and not improved by hyperbaric oxygenation. Caudal nerve action potential, which was significantly reduced in this group, was normalized after hyperbaric treatment. Resistance to ischemic conduction failure was increased in untreated diabetic nerve but not significantly different from controls after hyperbaric exposure. These findings indicate that treatment with hyperbaric oxygenation will partially reverse the neuropathy encountered in chronic diabetes. The biochemical changes are suggestive of enhanced nerve energy metabolism induced by hyperbaric oxygenation. The altered albumin blood-nerve barrier index presumably results from the action of free radicals on endothelial cells. Department of Internal Medicine, Charles R. Drew University of Medicine and Science, King-Drew Medical Center, Los Angeles, California 90059, USA. This 3-month study evaluated the effects of hyperbaric oxygen on drug-induced neuropathies in 22 patients with human immunodeficiency virus. All patients included in the study had been taking an antiretroviral medication for at least 12 months and had subjective symptoms of numbness or tingling, lethargy, and a decrease in deep tendon reflex. Patients with an active substance abuse history or Kaposi's sarcoma were excluded. Of the 20 patients who completed the series, 17 had significant improvement, 2 had a demyelinating disorder that may have affected the outcome, and 1 had no change. Effect of hyperbaric oxygen on ophthalmic artery blood velocity in patients with diabetic neuropathy. Okamoto N, Nishimura Y, Goami K, Harino S.
Department of Ophthalmology, Osaka Teishin Hospital, Japan. Jpn J Ophthalmol. 1998 Sep-Oct;42(5):406-10. To assess the relationship between blood flow and the complications of diabetes mellitus, we investigated the changes in the velocity of blood flow in the ophthalmic artery before and after hyperbaric oxygen therapy (HBO), one of the treatments for diabetic neuropathy. Color Doppler imaging was used before and after HBO. Seven diabetic neuropathy patients, 3 diabetics without neuropathy, and 7 normal, control subjects were enrolled. The patients were subjected to breathing 100% oxygen at 2.0 atmosphere absolute (ATA) for 1 hour. Hyperbaric oxygen therapy resulted in an average decrease in blood velocity by 15.0 +/- 9.0% (mean +/- SD) in normal subjects and 10.7 +/- 8.6% in diabetics without neuropathy. Blood velocity returned to the baseline level 4 hours after discontinuation of HBO. In contrast, blood velocity increased by 20.6 +/- 9.5% in diabetic patients with neuropathy irregardless of the severity of the diabetic retinopathy. The resistance index of the ophthalmic artery was not changed during HBO in the group with diabetic neuropathy, indicating that other mechanisms may be implicated, leading to the compensatory changes of blood flow. These results suggest that the increase in the blood velocity in the ophthalmic artery after HBO in diabetic neuropathy patients could be attributed to an imbalance in autonomic nervous function.